In the world of Legacy Storm combo there are a handful of shells and options available to the Real Men Who Play Combo. There are speed versions of Ad Nauseam Tendrils (ANT), versions with the powerful Burning Wish as a tutor (which also give you the power of Empty the Warrens), and other unique creations such as Jordi Amat’s Ill-Gotten Gains Tendrils deck (IggyPop 2.0). The version that I think offers the best balance of power, stability, and flexibility right now is a hybrid of Ad Nauseam and Doomsday strategies, or as we’ll call it ANT-Doomsday Hybrid. ANT decks are typically only running 1-2 copies of Ad Nauseam, along with a lot of fast mana, protection, tutors, and deck manipulation spells. They’re pretty straight forward, and ideally would like to kill the opponent somewhere between the second and fourth turn. Just set up by digging or tutoring for whatever you don’t have from these components, and then fire off a piece of protection (often in the form of Duress or Orim’s Chant) and then away you go with your fast mana spells and either Ad Nauseam or Infernal Tutor. Outside of a nearly full hand of cards and the ability to do an Infernal Tutor into Ill-Gotten Gains loop, much of the time ANT will seek to use its life as a resource to power up a game winning Ad Nauseam. But what if you don’t have a lot of life? Legacy decks are faster and more disruptive than ever, and you can easily be at only 13 life or less on turn 2 when facing a Zoo player (Steppe Lynx you for 4, Chain Lightning and/or Lightning Bolt you for 3, fetchlands, etc.). In these cases, or the cases that you facing down a quick Tarmogoyf and your first spell or three were countered, you can’t necessarily leverage the power of Ad Nauseam to generate enough of a Storm count to kill your opponent with Tendrils of Agony. This is where the card Doomsday shines. It doesn’t require a lot of life to win the game. A lot of people seem to be hesitant to include Doomsday or look at it as a viable alternative in Storm decks because they either don’t feel comfortable or knowledgeable enough to abuse it. Brandon Adams (known as emidlin online) and Michael Seubert (known as cheeseburger online) have co-authored a handy guide to using and creating Doomsday piles, and have done a fantastic job at providing a list of many options and even arithmetic formulas to teach you how to craft the perfect pile for whatever scenario you’re in during a game. Victor Martinez (known as gocho online) took this a step further and used those lists to make a convenient spreadsheet available to the public. I won’t go into all of the details of each pile because there are so many variants and Brandon and Michael have already done a great job of explaining them, but being uncomfortable with Doomsday should not be an excuse for you in the future if you read these. Doomsday is an extremely powerful and important weapon that provides the Storm player with another path to victory that doesn’t depend on a lot of life as a resource, which is often very critical in Legacy if things don’t go according to plan early in the game. In Tomoharu Saito’s build of ANT that he piloted to a Top 8 birth at GP Madrid 2010 he chose to use a combined 6 Duress and Thoughtseize effects as his disruption suite, in order to stay primarily Black and Blue (he had no White) and presumably to gain information about his opponent’s hand. The debates about which disruption cards you choose can go on forever, but Orim’s Chant provides an ultimate finality if resolved, and if you resolve one before attempting to combo off you should win 95% of your game or more. The same cannot be said for Duress, as the opponent with other non-Force of Will spells can still interact with you, which you want to ultimately avoid. The other advantage of playing Orim’s Chant is its usefulness against other combo matches. 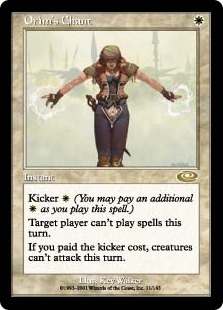 While Duress is certainly nice at stripping away a key spell, it does nothing in the face of Brainstorm or Mystical Tutor, and by allowing your opponent to cast a few spells and then casting Orim’s Chant you have actually made them expend or waste Storm and mana resources, which is often better and will lead to more victories for the player packing Chant. For these reasons I strongly advocate Orim’s Chant as the top choice, and your additional disruption slots can be composed of whatever you think is best. Most ANT decks will run a number of the cards above, but with the ANT-Doomsday hybrid deck Sensei’s Divining Top is extremely good. It is a great first turn play that can filter your draws as the game goes on, dig for mana to ensure you hit your land drops, and works extremely well with Mystical Tutor and Doomsday. Many decks (especially game 1) are serious underdogs to your storm deck no matter what shell you are using, so it makes sense to build to also be as strong as possible against those matches that are tougher. When playing this deck you really want have as many cards in hands as possible (to generate storm) and to be able to hit your land drops. To this end you want to reduce mulligans and to make your opening hands as consistent and keepable as possible, so in this regard having more lands rather than less will be better, as will having fewer cards like Chrome Mox in your opening hand. Playing a stable manabase and hitting your land drops will strengthen your matchups against decks with Wasteland and decks with counterspells, so having the strongest manabase possible while still being able to play your powerful spells should be your goal when building this deck. So let’s jump in to building the manabase. I tend to fetch out basic lands whenever possible to play around Wasteland (and other non-basic hate), so even though we have four colors in this deck I recommend keeping the dual lands to a minimum and including as many basic lands as you have room for. 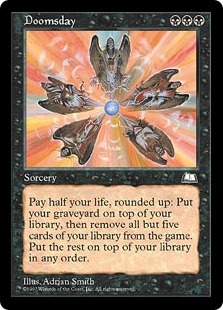 Saito’s GP deck had only one basic land, but for a deck like this you always want stable mana. Some people will question the inclusion of many basic lands or of a maindeck Plains, but this again goes back to building your deck to playing against tougher matchups (such as Canadian Threshold). You really want basic lands to keep being able to reliably cast your important spells (such as Orim’s Chant), and there’s enough extra mana sources like Lotus Petal and Lion’s Eye Diamond that you don’t really have to worry much about having the correct mana when comboing out. There is also a good amount of colorless mana in many of your spells (Meditate, Sensei’s Divining Top, Cabal Ritual, Infernal Tutor, etc. ), so keep in mind you can always use your Plains or whatever White mana source to help in casting those (or with activating Sensei’s Divining Top nearly every turn) if you aren’t using it for Orim’s Chant. You’re probably going to destroy other matchups that can’t disrupt your manabase and interact with you, so this doesn’t matter too much there. The sideboard above consists of options for dealing with problematic permanents, more disruption against counterspells, and the ability to switch to the Doomsday kill as your primary kill. Xantid Swarm single-handedly invalidates a lot of hate, and I think it is great for the Green splash, which you’re already probably going to have to be able to play either Krosan Grip or Reverent Silence. Dark Confidant was also seen in both Saito and David Do Anh’s sideboards in their GP lists, and I think that has merit and is worth heavily considering if Sadistic Sacrament catches on as a sideboard card. You can tailor this to meet your needs, but here is a brief rundown of how I would attack many common matchups with the deck and sideboard above. This is an interesting matchup for you, because their deck can be all over the board. They may have Wasteland, Stifle, Daze, Force, or they may eschew the mana disruption plan altogether for stuff like Spell Snare. They can have a quick clock in the form of Tarmogoyf or Rhox War Monk, not to mention Progenitus if they find a Natural Order before you’re able to kill them. I can’t give you a solid sideboarding suggestion here, because a lot of it will come down to what you’ve seen from their deck. You’ll want Slaughter Pact/Deathmark for any potential hate creatures they may have (Meddling Mage, Ethersworn Canonist, Gaddock Teeg), or even to deal with a quick Rhox War Monk. You can look at the Threshold and CounterTop matchups for tips if you’re really clueless, but Xantid Swarm, Carpet of Flowers, and the Doomsday plan all have merit here depending on you’ve seen or suspect they might have, so play this one by your gut. Rather than hoping to be able to tutor or draw for Ad Nauseam and the accompanying Angel’s Grace after sideboard against a lot of decks where life is an issue, you can simply use the mana and Storm instead to leverage the power of Doomsday. I highly recommend reading Brandon and Michael’s Doomsday primer in the link provided earlier. I feel that this hybrid strategy is currently the best way to pilot a Legacy Storm deck, given what we’ve been seeing from late 2009 into early 2010. You can expect to face Zoo and Merfolk and a myriad of other decks in each tournament you attend, so this approach allows you to have a consistent manabase and to be able to easily shift your plan of attack. Doomsday is an important and powerful piece of the Storm players’ repertoire that should not be overlooked, and works exceptionally well in the context of this deck.